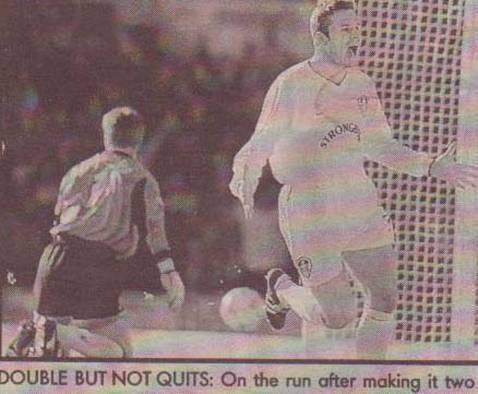 Date: Saturday, 4th November 2000. 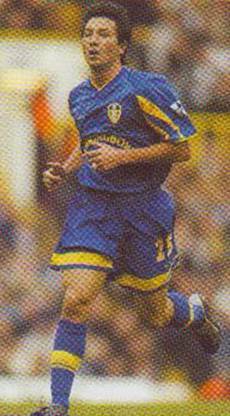 Scorers: Leeds United: Viduka (4). 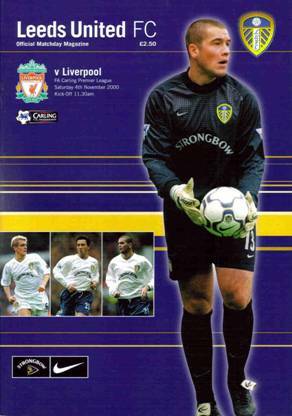 Liverpool: Hyypia, Ziege, Smicer. 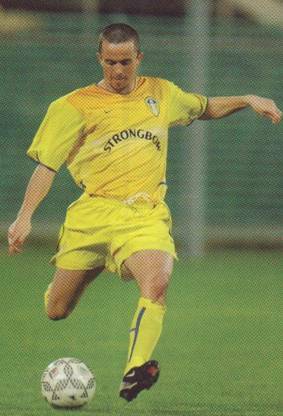 Referee: Mr D. Ellery (Harrow-on-the-Hill). 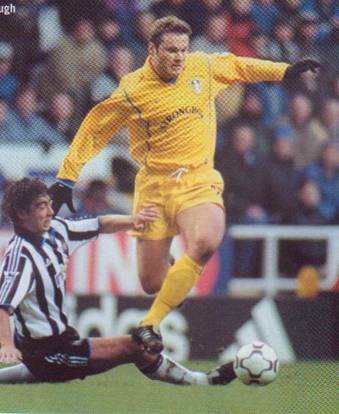 The avaricious appetite for goals which made Mark Viduka the leading goal-scorer in Scotland the previous season had been far from satisfied and this game showed that it would threaten the EPL defences for years to come, as the huge and immensely talented Australian’s exquisite quartet took him to ten in just fourteen games. 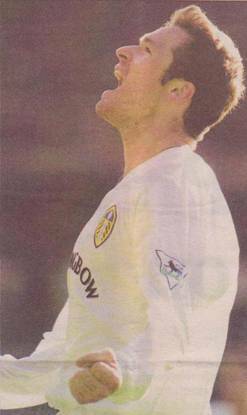 Pleasingly, Viduka’s goal-scoring knack was also matched by his ability to hold up the ball and some excellent close control. 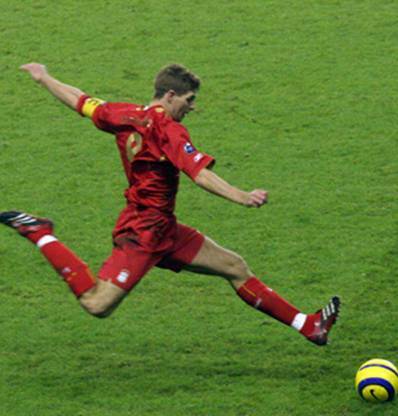 He made his £6 million fee from Celtic look money well spent and, as the Game was beamed live around the world as a live TV event, millions were able to marvel at his skills and goal-scoring ability. 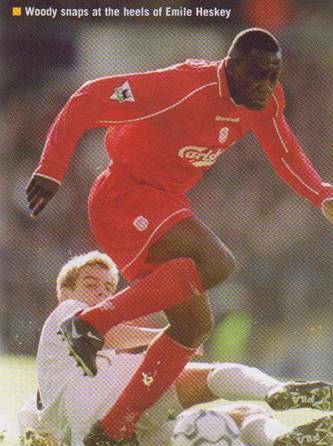 An away win seemed a certainty as Liverpool swept into the lead with a goal in one hundred seconds and then went two up after only seventeen minutes and threatened to run riot with a series of assaults on Paul Robinson’s goal. 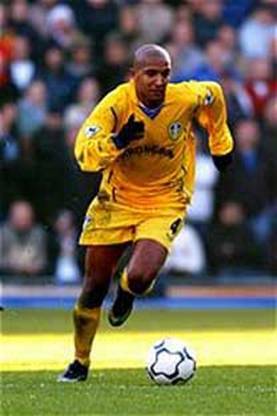 United had been boosted by the return to midfield of Olivier Dacourt and Lee Bowyer, while Dominic Matteo reverted to a central defensive role, alongside Jonathan Woodgate, against his former club. 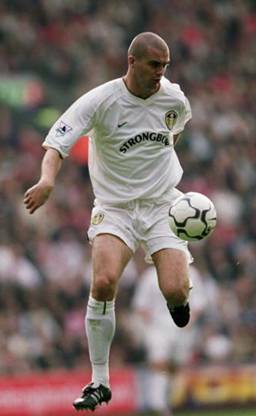 Manager O’Leary took the unprecedented step of naming only four substitutes as an injury crisis had continued to decimate his squad. 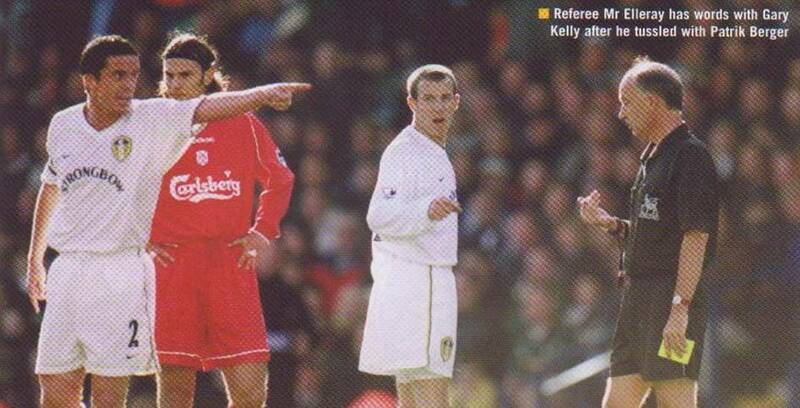 Christian Ziegler’s early free-kick had found Emile Heskey, but he was not able to properly direct his header. 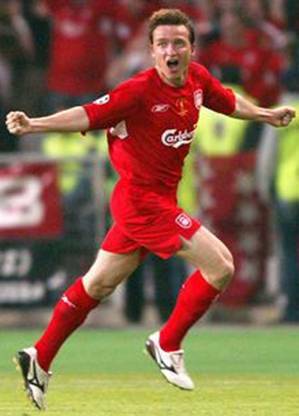 However, Liverpool raced into the lead in less than two minutes. 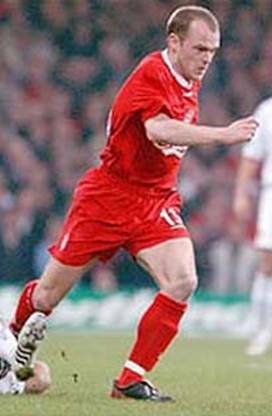 Another free-kick out on the right was floated over by Patrik Berger and Captain Sami Hyypia rose above everybody to glance his header into the far corner. 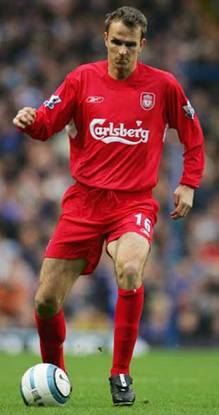 It was all Liverpool and when Jonathan Woodgate failed to clear properly Patrik Berger was allowed a free shot at goal, but it bobbled wide. 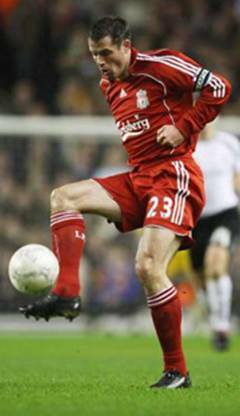 United were dealt another blow when Jonathan Woodgate was forced to limp out of the action on sixteen minutes with a pulled thigh muscle to be replaced by Danny Hay, and immediately, Liverpool went two up. 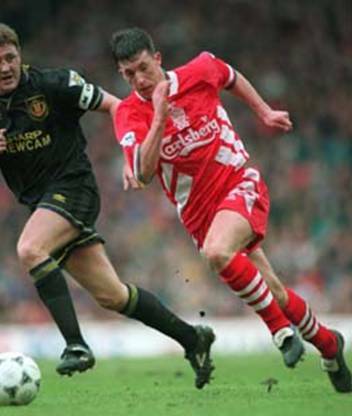 Gary Kelly upended Patrik Berger on the left and when Gary McAllister delivered his free-kick Christian Ziege was miles above the pack to head home. 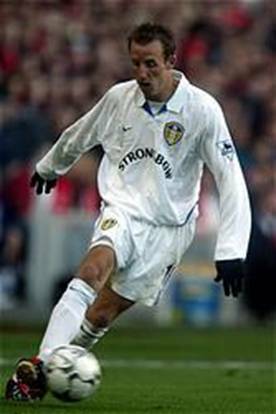 Leeds at last manufactured an attack and when Jacob Burns crossed Alan Smith did well to get in an header, which was not far wide of the target. 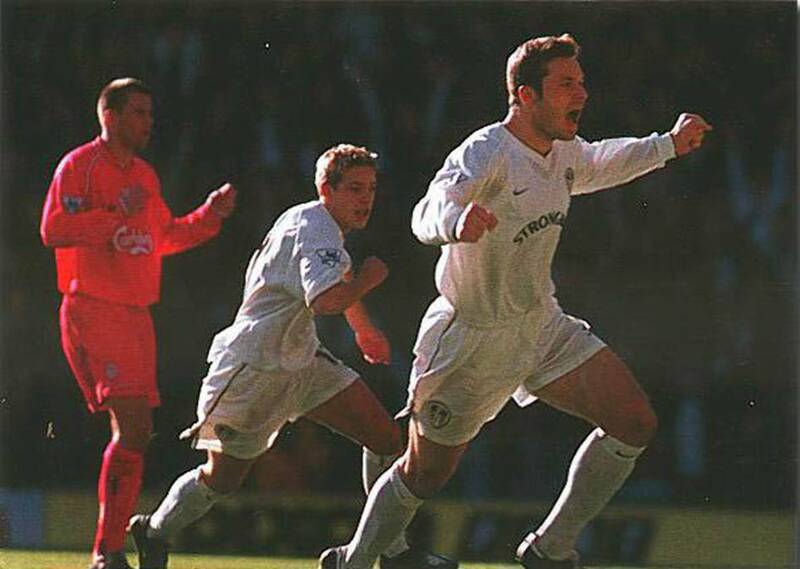 Then United pulled one back in the twenty-fourth minute, the persistence of Alan Smith allowing him to rob the statuesque Christian Ziege before bringing Mark Viduka into play. 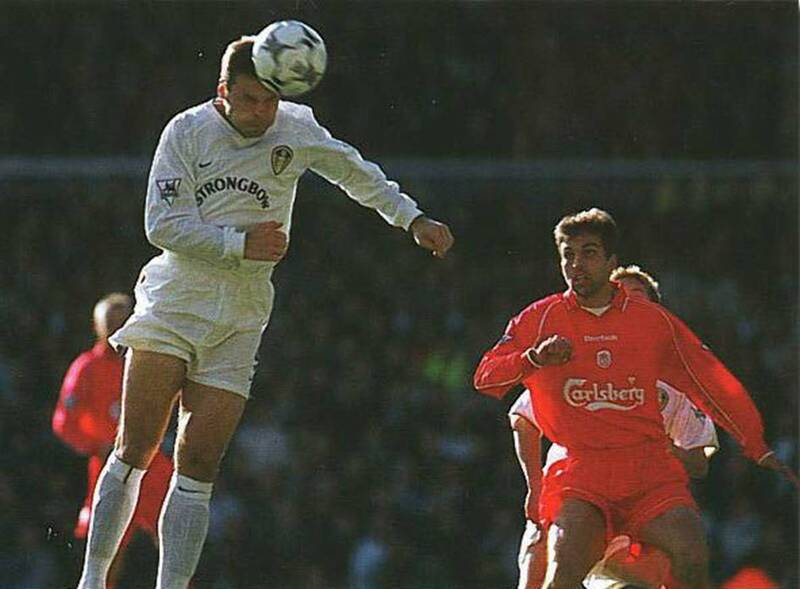 Cleverly, Viduka chipped his shot over the advancing Sander Westerveld and Leeds were back in it. 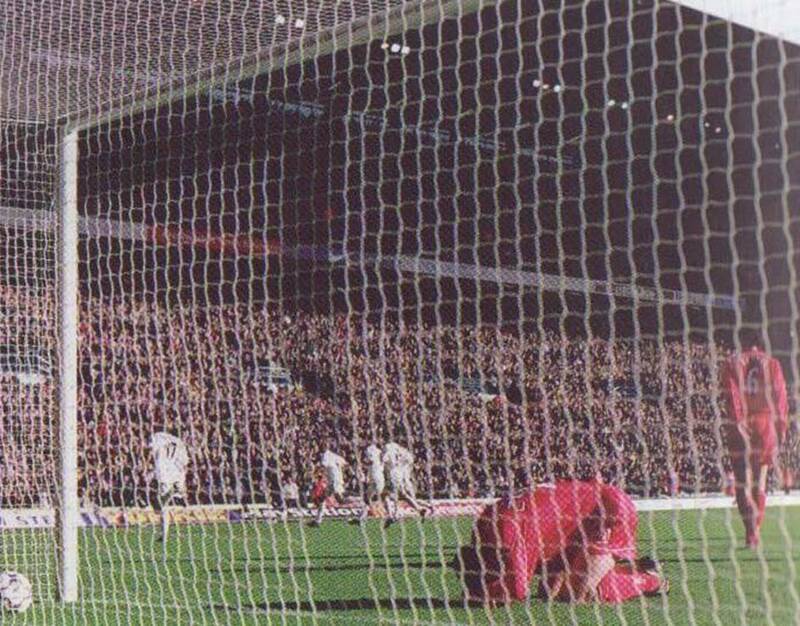 United were caught napping by a quick free-kick, which saw Vladimimir Smicer shoot narrowly wide, then Gary Kelly was forced to concede a corner as Emile Heskey threatened. 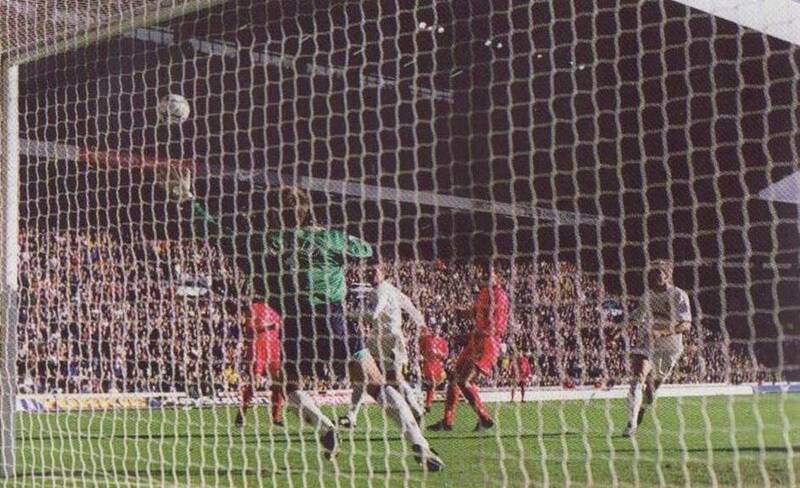 Liverpool wasted a golden opportunity to extend their lead eight minutes before the break when Christian Ziege’s cross gave Vladimir Smicer a free header in front of the goal, but he was well over the bar. 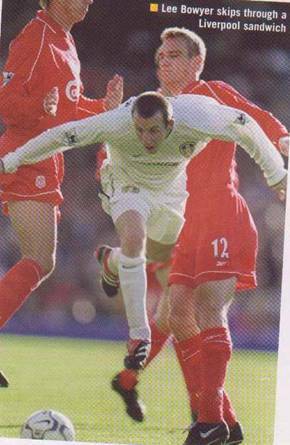 Then Paul Robinson saved the day with an excellent one-on-one stop from Dietmer Hamman as the United defence went AWOL. 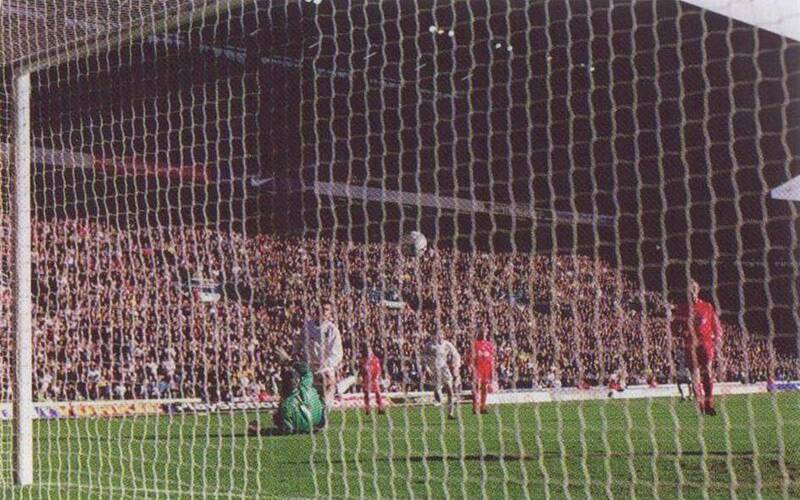 And United breathed again when Emile Heskey’s powerful header from a Gary McAllister cross looked certain to go in, only for Gary Kelly to pop up from nowhere and direct it for a corner. 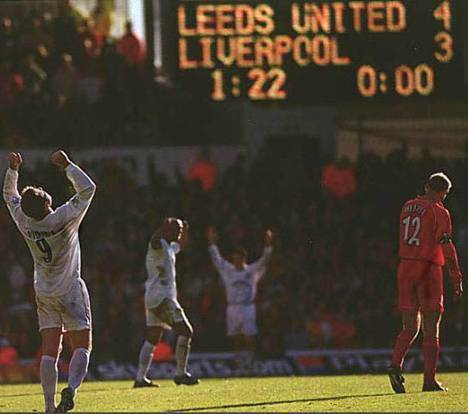 A splendid shot from Olivier Dacourt brought a flying save from Sander Westerveld as Leeds rallied and when Patrik Berger handled on the edge of the area Ian Harte’s free-kick was headed clear via a post by Gary McAllister. 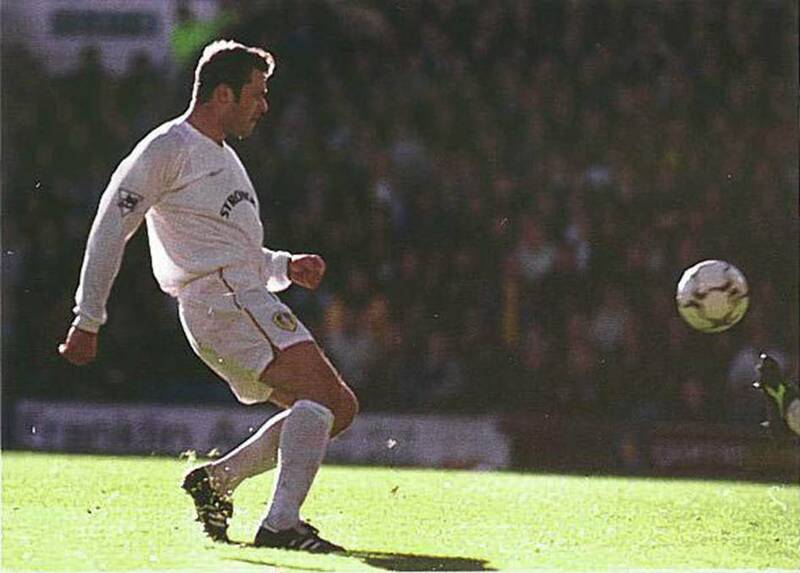 Within a minute of the restart Leeds were level, Gary Kelly bursting down the right from Eirik Bakke’s quick free-kick and crossing brilliantly for Mark Viduka to head powerfully home at the near post. 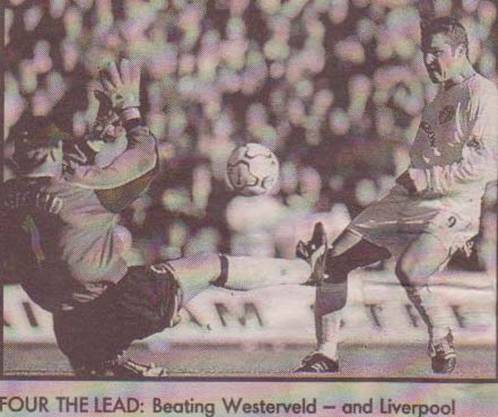 They should have gone ahead in the fifty-first minute when a poor back-pass from Markus Babbel let in Alan Smith, who having rounded Sander Westerveld, was casual enough to allow Jamie Carragher to get a vital goal-saving challenge. 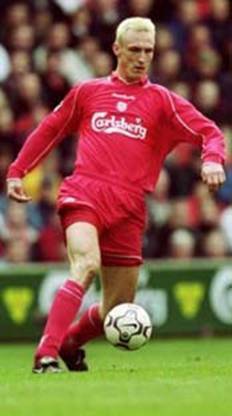 At the other end Paul Robinson spread himself to keep out Emile Heskey, but Liverpool were swiftly on the offensive and Ian Harte got in a vital block to keep out Markus Babbel’s goal-bound header from Patrik Berger’s cross. 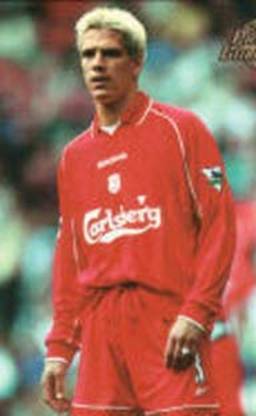 Liverpool were back in front on the hour when, after good work by Christian Zeige, Patric Berger crossed for Vladimir Smicer to cut inside Dominic Matteo and bury his shot in the bottom corner for his first goal of the season. 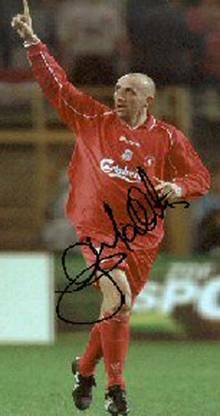 Lee Bowyer spotted Sander Westerveld off his line and tried a lob that was too high before Liverpool made a double substitution in the sixty-seventh minute, introducing Steve Gerrard and Robbie Fowler for Danny Murphy and Gary McAllister. 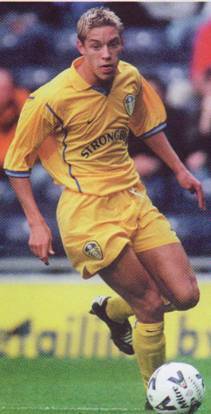 Olivier Dacourt’s powerful shot from Lee Bowyer’s corner was kept out at some personal cost by Christian Ziege and then, in the seventy-third minute, an excellent ball from Olivier Dacourt found Mark Viduka, who twisted and turned his way through two challenges before firing home for a splendid hat-trick. 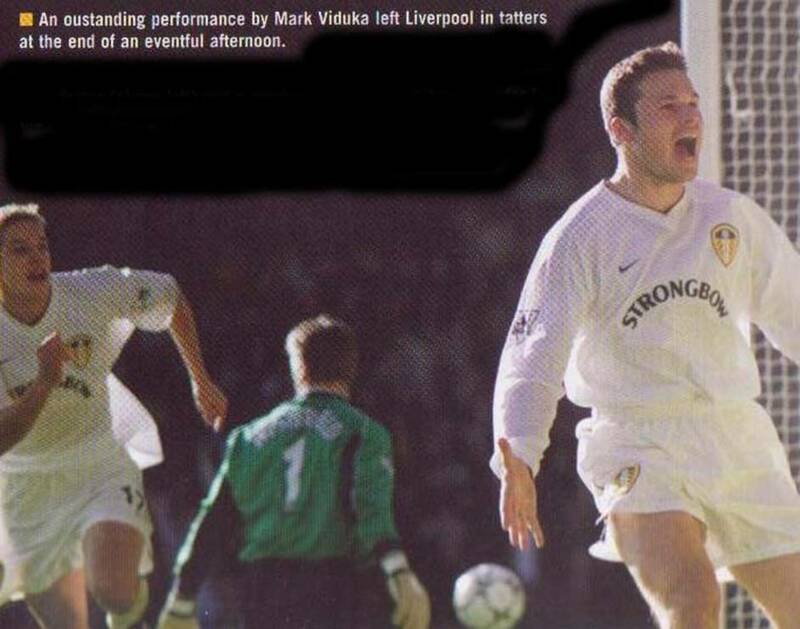 Ten minutes later United, incredibly, were in front for the first time in the game and it was that man Viduka, who again did the damage, picking up on Olivier Dacourt’s miss-hit shot and delicately chipping in. 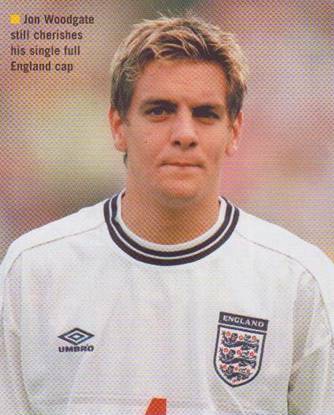 It had been a fantastic match, but the kind that guarantees managers with high defensive standards, premature baldness. 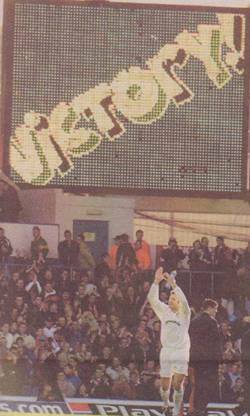 Frodi Kippe, Dominic Matteo, Rigobert Song. 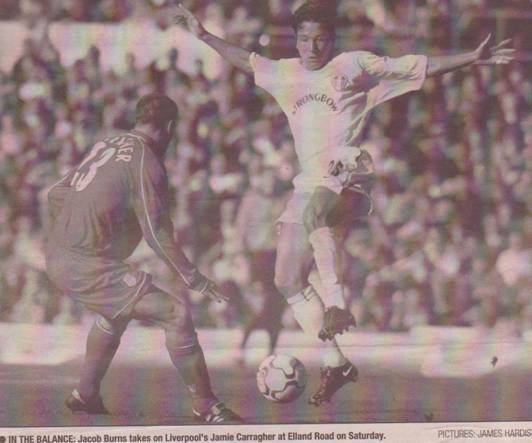 Gerrard Houllier (Manager), Robbie Fowler, Nick Barmby, Jamie Carragher, Michael Owen. 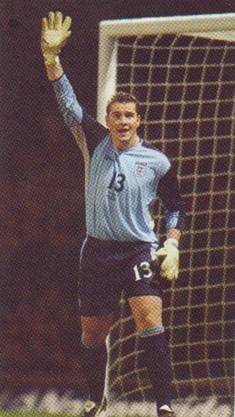 fine saves. 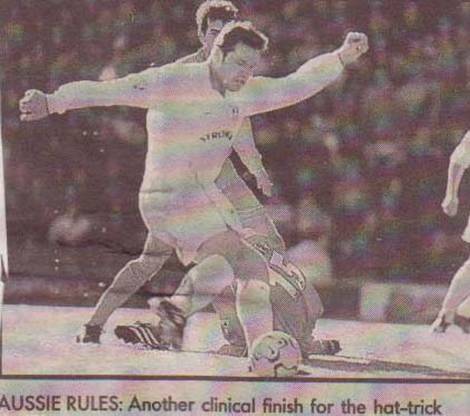 who was soon injured.